If you're in the midst of designing a nursery, you're probably looking for somewhere for baby to sleep (or you should be...). Babies spend nearly half of their early months snoozing, which is also when they do all their best growing, including developing their brains and immune systems. So, the best baby cot bed mattress will play a huge part in giving your household the best chance of decent sleep. If you're looking to find the best mattress for your needs, you'll find plenty of choice from our recommendations. For the best mattress for adults, don't miss our guide. And if you need more guidance, read our comprehensive feature on how to choose a mattress: it takes you through filling types and your preferred sleeping position to help you make an informed choice. For all our mattress reviews, buyer's guides and advice pieces, check out our mattress hub page. But if you're after a mattress deal, we've got all the bargains. Find out how to design a nursery in our practical guide, and choose the best cot in our buyer's guide, too. You’ll need one that supports baby’s spine properly – experts say the firmer the better in the first six months. Check the fillings of the cot mattress you're buying – breathability to keep baby cool in bed is a must-have. Also look for practical features like removable covers that can be washed at a germ-busting 60 degrees because there will be spillages from one end of your baby or the other (possibly both), sorry. Stop stressing over whether your baby is sleeping too hot with the eve cot bed mattress. A mini-me of its popular memory foam mattress, we applaud its cooling properties, which are achieved using highly breathable Cairful 3D fabric that encourages air circulation. Apparently Cairful 3D is 400 times more breathable than standard mattress fabrics – wowsers! Made with advice from the BPA (Baby Products Association) for extra peace of mind, too. Read our review of the (adult-sized) Eve mattress. A pint-sized version of Simba’s award-winning Hybrid mattress, the Simba Hybrid cot mattress is fully loaded with the latest bed-in-a-box benefits. As the name suggests, it’s a mix of mini springs and memory foam. The cover is hypoallergenic, can be washed at 40 degrees and its zip faces inwards to prevent the risk of it catching or scratching baby – clever. The best baby mattress for those looking for something feature packed, we think. Read our review of the (adult-sized) Simba Hybrid mattress. With its extra waterproof cover, this is the best baby mattress for puke-prone babies. Basically, the waterproof outer cover is washable at 60 degrees, while the inner cover is also waterproof so works as a good temporary surface while your washing machine is doing its thing. Construction is a foam and spring combo offering medium firmness. You can’t move for enthusiastic reviews of The Little Green Sheep’s best-selling Twist Natural Cot Mattress on parenting chat sites, so we’d be remiss not to include it in our list. The Twist’s main USP is that it’s dual-sided – the firm side is recommended for birth to 12 months, while the medium side will carry them comfortably up to five years. In our opinion, this is the best baby mattress for those looking for something natural. 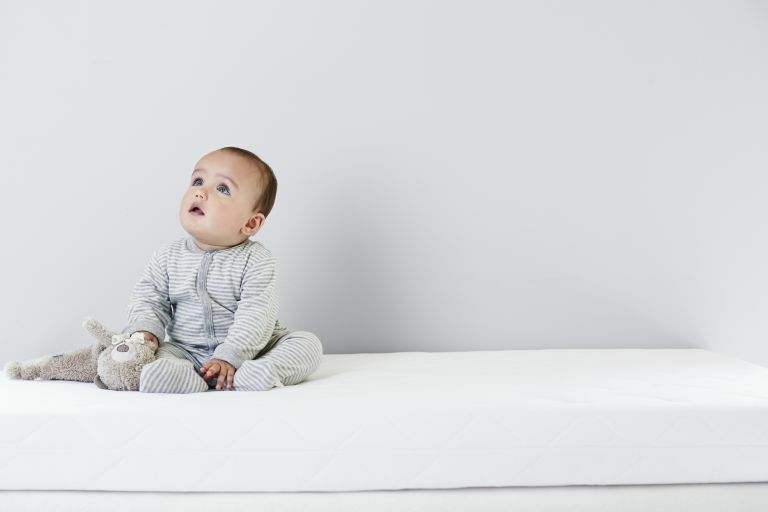 Mothercare’s top-end cot mattress also has allergy protection at its heart, this time using a clever probiotic textile treatment that naturally deters allergens created by dust mites. Pocket springs, (180 of them, to be precise) provide zoned support and a waterproof barrier keeps the core protected from ‘little accidents’. It may be the cheapest cot bed mattress in Silentnight’s new Safe Nights range, but the Essentials covers all the basics for a decent sleep. Foam and chemical free, it’s made from 100 per cent recyclable Eco Comfort fillings – so you can start baby off with a clean eco conscience - plus the cover is washable, which is always a good thing. The best baby mattress for those on a budget, we think.